The state of the U.S. wine industry is strong but subject to numerous challenges including competition from imported wine, according to four authoritative observers who spoke today at the Unified Wine & Grape Symposium in Sacramento. The speakers examined the global economy, consumer demand, bulk wine supply and grapegrowing capacity for a crowd of about 1,000 attendees at the combined trade show and conference, which is the biggest event of its kind in North America. Unified is sponsored by the California Association of Winegrape Growers and the American Society for Enology and Viticulture. Economist Mike Veseth, who has researched and written extensively about the global wine economy, acknowledged that the industry’s status is very healthy but added that a new administration in Washington, D.C., and the imminent exit of the United Kingdom from the European Union loom as unknowns that might upset the situation. He observed that the U.S. dollar is at its strongest point in 14 years, while the British pound has dipped dramatically since UK citizens voted in favor of Brexit. Even though wine sales in the United States are growing faster than many other sectors of business, Veseth said the higher dollar has hurt wine exports somewhat and encouraged imports (even at the luxury level) to increasingly enter the domestic market and compete with U.S. wines. The UK is the world’s biggest importer of wine, and as the British pound has dropped, prices of Italian and French wines there have pushed upward. Veseth said this tends to slow sales and prompt producers in those countries to switch their export emphasis to the United States, the world’s second-biggest importer, which in turn might slow domestic wine sales. 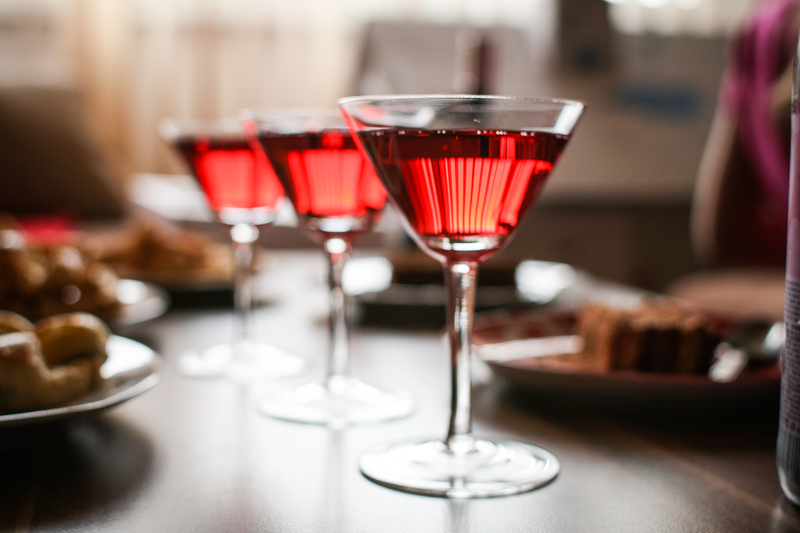 Nielsen sees wine as trophy category The good news is that America’s love affair with wine endured and expanded in 2016 as consumers found wine available in more locations and traded up in price, said Danny Brager, vice president of the beverage alcohol practice at The Nielsen Co. Purchases of wine grew at six times the rate of consumer packaged goods in general, and California wine gained four times more volume than its biggest import competitor, Italian wine. Brager said, “I really think wine is a trophy category.” Table wine consumption in the United States grew by 1.8% in volume and 4.4% in dollars at the stores where Nielsen measures about 60% of U.S. off-premise sales. One of the driving factors was increasing availability of wine. Brager noted that 553,000 U.S. on- and off-premise locations now sell wine, which is 120,000 more locations than 10 years ago. 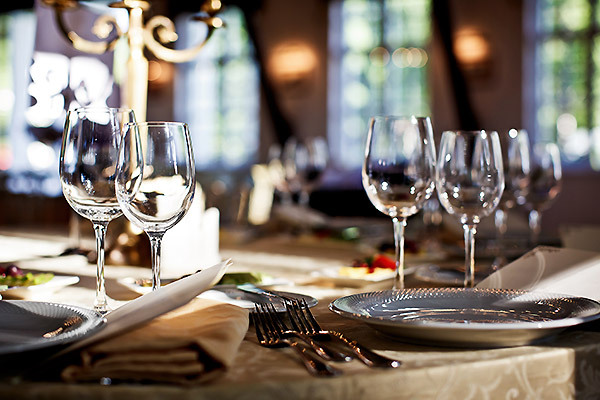 Nail salons, book stores, movie theaters and even car washes now serve wine, and some grocers such as Wegmans, Kroger and Whole Foods serve food and on-premise wine in their stores, spawning the term “grocerants.” Brager addressed the concern that spirits, craft beer and even cannabis might be diluting wine’s strength. Spirits did grow half a percentage point faster than wine, but the growth of beer was just half that of wine. Brager presented survey results that indicated beer consumers are not giving up wine, and 85% of wine drinkers don’t think marijuana legalization will affect their wine consumption. He said the average price of a 750ml bottle of wine is passing the $10 mark for the first time, reflecting the continuing premiumization trend in which price tiers at $11 and up are growing rapidly while those in glass bottles priced under $8 were flat or shrinking. 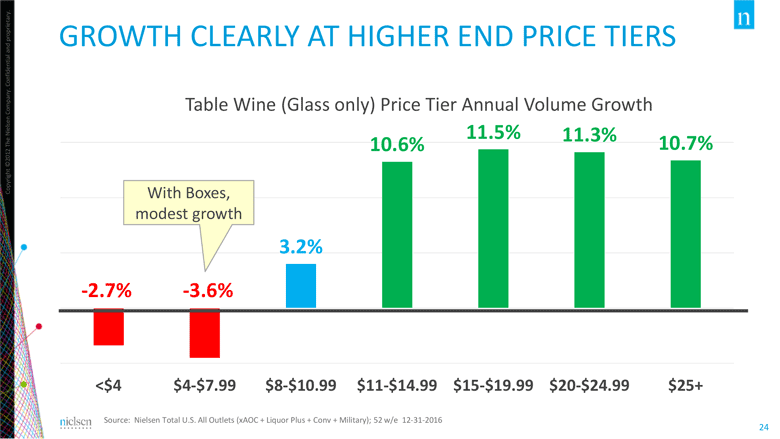 However, if premium-priced box wines were added in, the $4-$7.99 segment would be growing. 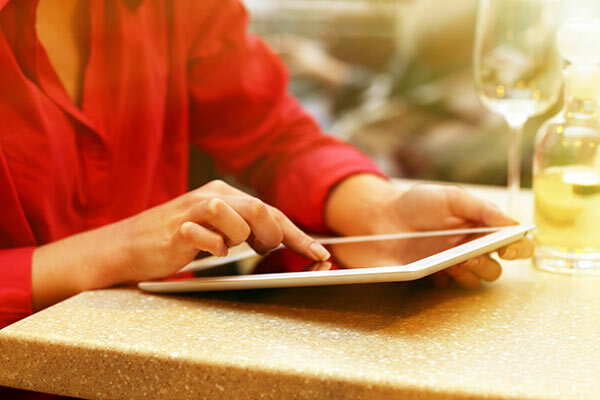 Contributing to the upward movement in price were several fast-growing and generally high-priced types and varietals such as rosé, Sauvignon Blanc and sparkling wine. Brager singled out a number of brands that had the fastest rates of growth, particularly Josh and Apothic. Two wineries with more than 100,000-case increases and double-digit growth rates were Riboli Family Winery Estates and Delicato Family Vineyards. Coastal bulk wine prices up Glenn Proctor, partner with the international wine and grape brokerage The Ciatti Co., focused on the bulk market and global wine and grape production. 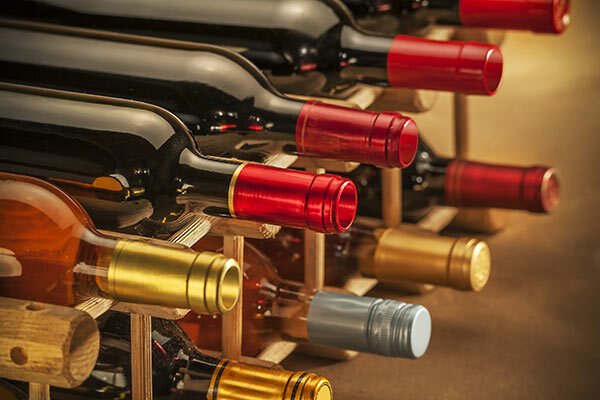 He said the domestic bulk wine market is balanced, but prices are increasing for wine from coastal regions as wineries seek to meet demand from the wider premiumization trend. “Availability has declined and prices have increased,” he said. Proctor noted a bifurcation between demand for wine the Lodi AVA and Delta area and the southern parts of the interior valley. As wineries seek to maintain margins and increase production of successful brands, he said many are having to look outside coastal regions for grapes and Lodi and the rest of the northern half of the valley are becoming popular options. For lower priced grapes and wine, the biggest competition is from imports. In discussing the global market, Proctor singled out Chile as a foreign source of grapes and wine that could become more popular in the coming year. Chile harvested nearly 1.6 million tons in 2016, and its grape and wine quality continues to improve. 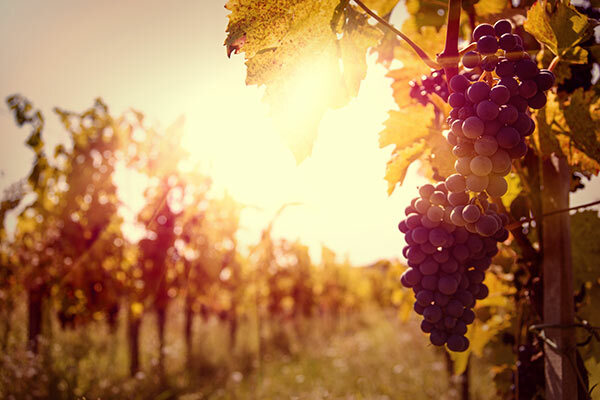 Growers in the South American country have planted more acres of vines including Cabernet Sauvignon, Merlot, Pinot Noir and Sauvignon Blanc, and Proctor said it’s easy to find good quality wine of these varieties at around $4 per gallon. The Chilean peso is cheap compared to the dollar and is expected to fall further in value, making Chilean imports even more desirable. “They’re going to continue to be a large exporter,” Proctor said. “It’s definitely a country to watch.” Chile’s 2017 harvest likely will be reduced by raging wildfires that are currently burning and already have destroyed more than 100 vineyards, according to Decanter and other news media. France and Italy pose the biggest threats to U.S. producers as sources of bottled imports and a strong dollar isn’t going to help. The 2016 harvest in France came to 6.6 million tons, but that was much less than world leader Italy, which produced 7.2 million tons. Proctor said tighter appellation restrictions on Pinot Grigio could impact imports of that varietal, while Prosecco continues to do well as part of the wider surge in sparkling wine consumption. He said Spain, which harvested 6.4 million tons, has been a major supplier of bulk wine to China and the EU, to the chagrin of French terrorists who have intercepted and dumped tanker trucks of wine as well as vandalized storage tanks, could be headed for an oversupplied market as demand for generic varietal wine is softening. Like the other speakers, Proctor said the United States remains the most desirable market for all wine producers, and said in the wake of Brexit it likely will only become more competitive—especially in light of declining consumption in Europe. “Where is the growth?” he asked. “Right here in your back yard.” The amount of bulk wine imported to the United States has steadily grown in recent years, while the amount of imported bottled wine has stayed stable. France and New Zealand are the leaders in terms of average price per case for bottled imports. Unless Central Valley producers can be globally competitive, U.S. wine companies may support lower priced brands with imported bulk wine and use premium grapes to compete with bottled imports on quality. Proctor ended his presentation with a reminder that the market will swing back to being oversupplied at some point and it’s always hard to predict how the global market will respond. “Everything we expect will be a little different,” he said. “I can guarantee that.” Grape expectations Nat DiBuduo, president of Fresno, Calif.-based Allied Grape Growers, addressed planting trends and grape supply based on a survey of California nurseries that sell grapevines. He estimated that the 2016 wine grape harvest in California would come in at 3.9 million tons once tallies are finalized for the annual California Grape Crush Report. The number is an increase from the previous year (3.7 million tons were recorded in 2015), but well shy of the 2013 bumper crop that tipped scales at 4.25 million tons. Wine grape planting fell in 2016 for the third consecutive year, and coastal regions represented a larger share of the new vines. DiBuduo estimated that between 15,000 and 16,000 acres were planted in 2016, saying the exact number depends on vine density per acre. He expects a similar number of acres to be planted in 2017, this time with even more devoted to coastal plantings. According to Allied Grape Growers’ survey of nurseries, the number of vines sold has dropped sharply from 2014. In 2016, 71% of the new vines sold were red varieties, and more than a third (34.7%) were Cabernet Sauvignon. Pinot Noir narrowly edged out Chardonnay to grab the title for second most popular variety for new plantings at 16.2% compared to 16.1% for Chardonnay. Pinot Grigio, Petite Sirah and Sauvignon Blanc also comprised more than 5% of new vines, although DiBuduo pointed out that the growth rate for Pinot Grigio plantings is slowing down. The breakdown by variety was a sharp change of course from 2011, when 56% of new vines were white varieties. Muscat of Alexander had the largest share at 22.15% of total new vines that year, followed by Cabernet Sauvignon, Chardonnay and San Joaquin Valley blender French Colombard. Price categories and location Following the premiumization trend, in which sales of more expensive wines are growing more rapidly than value wines, DiBuduo suggested 5,000 acres of vineyard for wine had been ripped up since harvest 2016 in areas where grapes are destined for wines priced less than $7 per bottle. These value wines represent more than half of California wine volume. The two ways to reverse this trend, DiBuduo said, would be for grapes from the lower San Joaquin Valley to start being used in higher priced bottles, or for the “buying up” pattern of wine sales to stall. 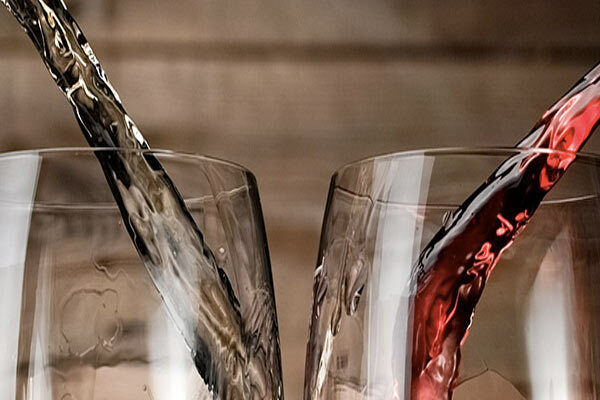 Between 2016 and 2019, DiBuduo expects Pinot Grigio, Petite Sirah and Pinot Noir from the lower San Joaquin Valley to gain bearing acreage at rates in the double-digits. The same varieties will be similarly popular in Lodi and other parts of California’s northern interior. Merlot and Zinfandel are expected to lose acreage in these regions. In coastal regions, he expects Cabernet Sauvignon to be the most planted, and Petite Sirah will pick up 27% more acreage, albeit from a small base. Wines from these regions are priced $10-$20 per bottle, the hottest segment of the market today. Wine grape acreage at the top end of the price scale—mainly Napa and Sonoma counties—won’t change much in terms of varieties planted before 2019, although the number of Pinot Noir acres are expected to grow about 7% in those regions. Sixty-four percent of coastal Cabernet Sauvignon planted in 2016 found its home in Napa and Sonoma counties, while the remaining 36% went to San Luis Obispo County. Sonoma County was responsible for 57% of new coastal Chardonnay plantings, while Santa Barbara County growers planted 37% of new Pinot Noir acreage among its coastal California neighbors.